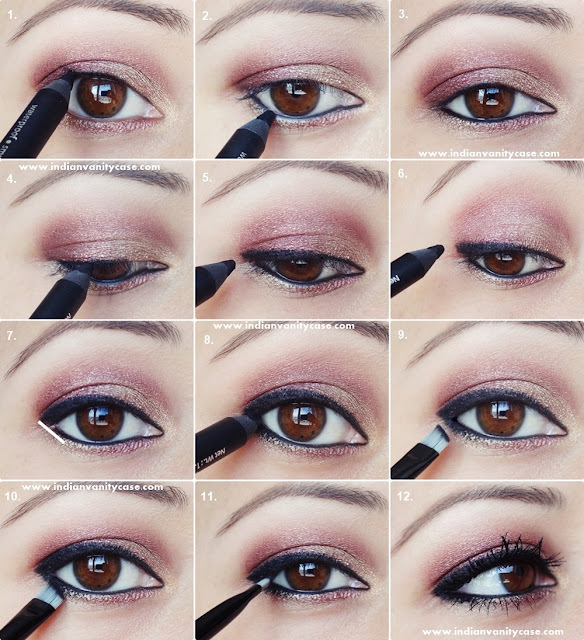 I've split this tutorial into two, so that I get to show you in detail how I did the eyeliner, as well. 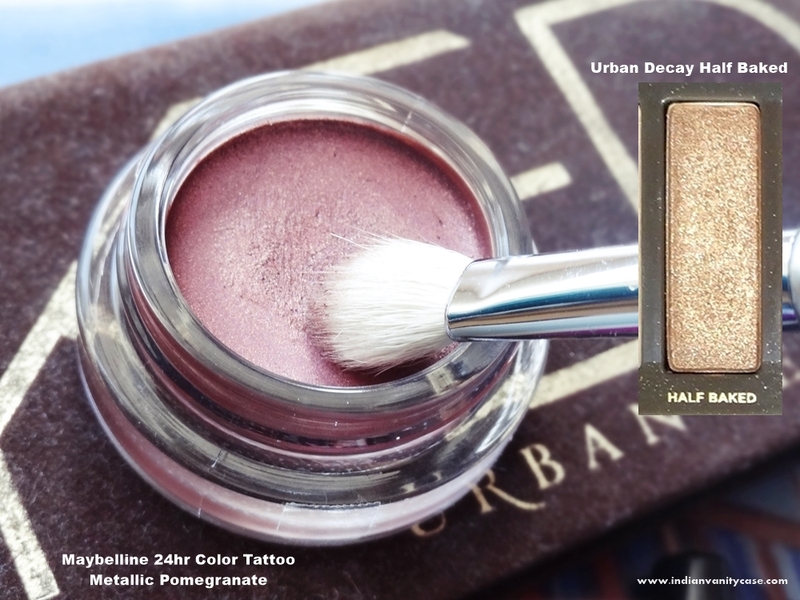 Gold Eyeshadow ~ Urban Decay Half Baked from Naked Palette. Mascaras ~ Maybelline The Falsies Black Drama & Bourjois Fan-Tastic Volume. Brushes ~ Sigma E25 Blending Brush, Urban Decay Good Karma Brush. 1. Take Metallic Pomegranate on ring finger. 2. Apply it on your lid till your crease. 3. It should look like that. It's okay if the edges aren't neat right now. 4. Now take the same color tattoo on a fluffy blending brush, and go over the edges of the shadow using windshield wiper & circular motions. 5. Keep blending from one end to the other. 6. Once the edges look hazy, apply a gold eyeshadow on the inner half of your lid, but don't touch the upper edge of the previous e/s. 7. Apply the gold on your inner corner around your tear duct, as well. 8. Apply the same gold e/s on the outer half of lower lash line. 9. Apply the same metallic pomegranate on the inner half of lower lash line. *I'm doing this to balance the look. 10. Line your top & bottom waterline with black kohl pencil. Tutorial below. 11. Apply lots of mascara on top & bottom lashes. I applied 3 coats of Maybelline The Falsies Black Drama first, then about 2-3 coats of Bourjois Fan-Tastic Volume Mascara. Lashes look more clumpy up-close only. 1. Sharpen your kohl pencil first, then tightline upper lash line. That means lining on the roots of your lashes. 2. Line waterline all the way to the inner tear duct area. 3. See how that closes up my eye & makes it look smaller? 4. Start lining the top lash line. It's better not to drag it in one go. Make dots and join, instead. 5. 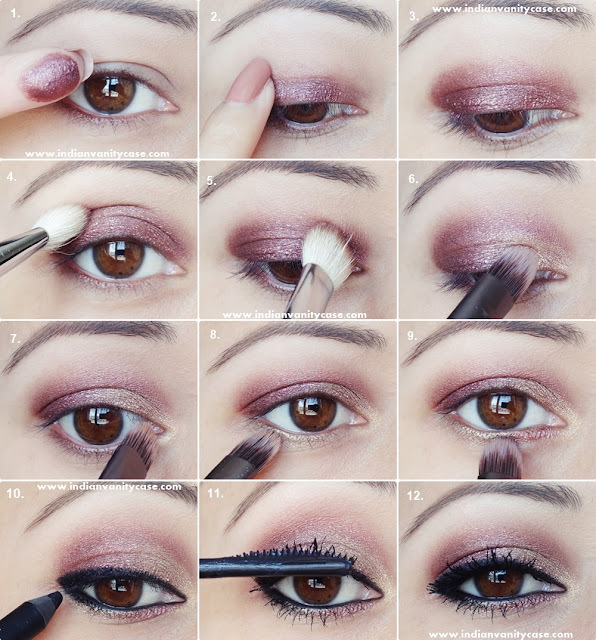 Make kohl thicker at the outer corner. Extend it a little past the corner of your eye. 6. It should look like that. 7. That white line is just to show you how to join with it with the lower lash line. 9. Lastly, take some matte black eyeshadow on an angled or pointed liner brush and press it on kohl. Again, don't drag the brush. This will prevent it from smudging & also even out the edges. 11. .....and upper lash line. It's my favorite way to line my eyes, i.e. when my kohl is sharp. Bollywood actresses like Bipasha Basu, Rani Mukherjee & Aishwarya Rai line their eyes this way a lot. 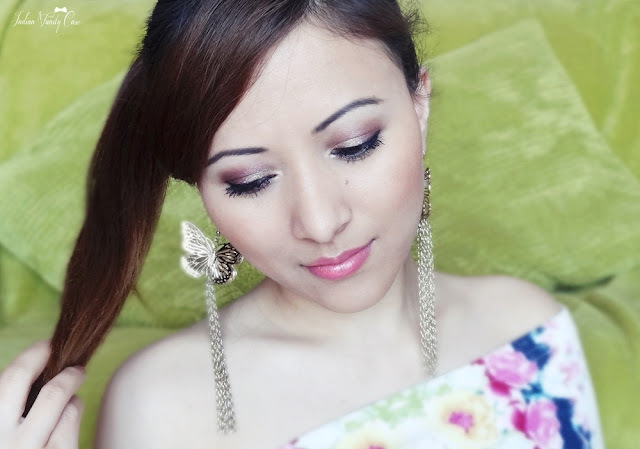 If you line all the way in on the bottom lash line, you'll achieve Rani Mukherjee's heavy kohl-ed eyes like I did in the Bombay Talkies inspired look here. Hope you picked up some tips from these 2 tuts (two.toots.) I will be posting more before the month ends. osma and wow tutorial :)loved both..
thanks for the tute :) I m gonna try this! & Golden Pomegranate wasn't a bad name !!! You are simply flawless Cynthia!! BEAUTIFUL.gonna try this. Woah !! It looks lovely. Great post doll..
Luv this tut CZ . . . am gonna try it . . .
Two thumbs up on your blog and articles. I love 'em! Just out of curiosity, you live in India.. and you visit Malaysia often.. Are you Malaysian? Your are simply flawless. This post is so amazing. Lovely tutorial. I am gonna try this for sure. Cynthia, I love your eye makeup tutorials. Nobody does it better! What's the difference between Pomegranate Punk and Metallic Pomegranate? so pretty! love love love the look, will try it and let you know how it goes! keep on posting beautiful lady!